I've liked the look of the RS Focus. That thing is supposed to rip real good. I drove an RS before I bought the ST. The RS really is a beast. I got tire chirp in 3rd gear from all 4 tires. But for ~$60k? Not that much of a beast. A guy at the track has a 2013 ST that he's done a lot of work to, and has more HP to the wheels than an RS, and it didn't cost him +$20k to build. It made more sense to me to buy an ST with all the interior appointments of an RS, and build the mechanical myself to make it comparable to an RS. Plus, I like tooling on a car. Makes me happy to temporally reduce universal entropy. Oh they do. My buddy has an ST too and that thing just rips up the road. The entertainment unit can read texts I receive on my phone, and I can use voice commands to respond. The Nav display shows a little traffic sign showing the speed limit of the road I'm on. Little things! But thoughtful things. And when you start pounding through the gears, and the turbo starts spooling up, and the yaw control starts pulling you around that corner at a buck ten . . . I've never thought of that.... It would be epic. Not really practical, but who cares. You'd have room for two stripper poles! You'd have more stripper poles. We have a few of those articulated buses here too... the new ones have air-conditioning... and Caleb, they already have about 50 stripper poles installed. I need to to take the bus more. But I took the car to the track yesterday. zOMG! It really beat me up. What a fun time. I filled it up on my way, did ~150km on track, and barely made it to a gas station before I ran out. My buddy with the heavily modified ST has to fill up after every 20 minute session. The BEAST lives again! Thundering zero point 6 LITER HEMI - able to crush beer cans completely flat - AWE at the ability of a 6 foot 2 driver to squish inside! Tremble in FEAR at the THREE CYLINDERS OF SCREAMING DEATH!!! Rebuilt the carb last summer, did some ignition work, just popped in new water pump fresh from Japan and a battery. Been sitting there in the driveway 5 years now. She who must be obeyed proclaimed "It's either fixed, it's gone, or it's a flower planter"...... so it's fixed! Now if I go down to Surplus Sam and buy a puptent to put in the bed, I'll have a motorhome any retiree can afford! No, this isn't mine. 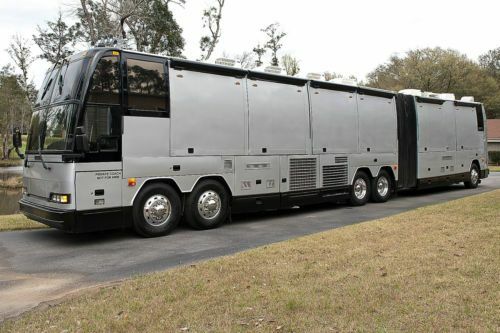 I'm making a comparison for a 60-foot bus. 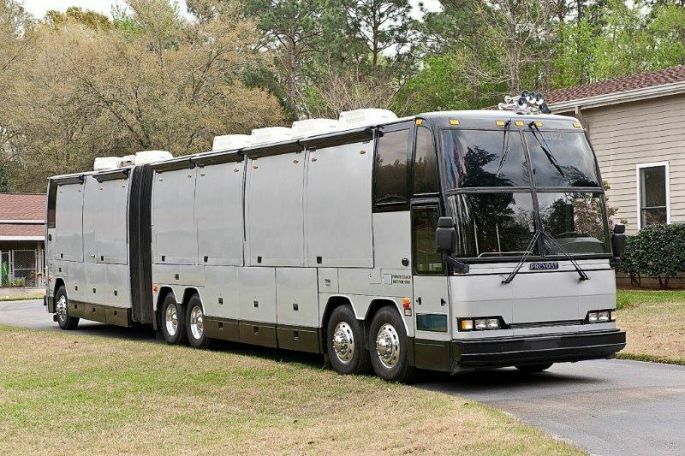 This is a 60-foot class-A motorhome. I often use this as a comparison for a Mars spacecraft. Some people criticized Mars Direct for being too spartan, but I point out the upper floor alone of the Mars Direct habitat was designed to be the same diameter as an Ares launch vehicle proposed as part of that plan. SLS that NASA is building now is based on Ares, and practically identical. The Mars Direct habitat would have 541 square feet for the upper floor alone, which is the same as a 60-foot class-A motorhome with slide-outs extended. Plus a lower deck that would have an airlock, landing rockets, fuel/oxidizer tanks, landing legs, RCS thrusters to manoeuvre in space, life support equipment, and a storage compartment the size of a single-car garage that would hold a Mars rover for 4 astronauts plus surface science equipment plus an inflatable greenhouse. The greenhouse would be a big plastic bag, as wide as a double car garage and twice as long. Anyone who still calls that spartan, say that to the face of an Apollo astronaut. You have a chauffeur. Lucky. And poles for all his stripper friends! Yeah. I go through a lot of them. Assholes insist I pay them up front. I only have stripper friends. When I die my funeral will have strippers so everyone has some fun, but they'll be male strippers so you don't have too much fun. I'll aim to put the "fun" back in funeral.